Kenya lies astride the equator on the eastern coast of Africa. It is a medium-sized country by continental standards covering an area of about 586600 sq. km. Inland water bodies cover some 10700 sq. km the bulk of this in Lakes Victoria and Turkana. Kenya is bordered by Somalia and the Indian Ocean to the east Ethiopia to the north Sudan to the northwest Uganda to the west and Tanzania to the south. 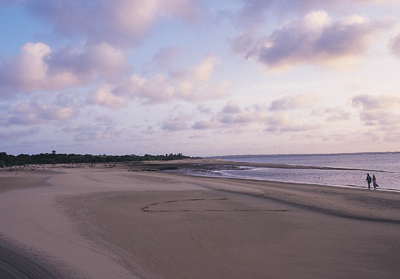 The coastline about 550km long faces the Indian Ocean. Kenya has tremendous topographical diversity including glaciated mountains with snow-capped peaks the Rift Valley with its scarps and volcanoes ancient granitic hills flat desert landscapes and coral reefs and islets. However the basic configuration is simple. Coastal plains give way to an inland plateau that rises gradually to the central highlands which are the result of the relatively recent volcanic activity associated with the formation of the Rift Valley. To the west the land falls again to the Nyanza plateau that surrounds the Kenyan sector of Lake Victoria and to the northto the rugged low country around Lake Turkana. 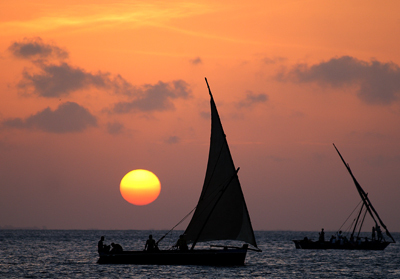 The Kenya coastline is broken and composed of beachescoral cliffs and reefscreeks and numerous offshore coral islands. Inlanda mainly level but narrow coastal plain lies on sedimentary rockswith some igneous intrusions. Beyond the low rolling hills lies the so-called Nyika Plateaumainly on sedimentary rocks. The Great Rift Valleywith its associated escarpments and mountainsis a major feature. It runs the length of the country from Lake Turkana in the north to Lake Natron on the southern border with Tanzania. The central portion of the rift is raisedwith the Aberdare Mountains and Mt Kenya to the east and the Mau Escarpment and Cherangani Hills to the west. The northern and southern sectors of the rift are low-lyingarid and ruggedwith spectacular volcanic landforms. The region west of the central highlands is characterized by Precambrian metamorphic rocks and linear basement hills. Mt Elgonan olderoded volcanointrudes through the ancient shield on the Uganda border. The Lake Victoria basin generally has a gently sloping landscape and an eroded surface that exposes granitic outcrops. In general terms temperatures in Kenya vary with altitude. Nairobi which is at an altitude of approximately 1670 metres (5500 ft)has warm/hot days for most of the year with temperatures seldom falling below 18 degrees C and often reaching 30 degrees C. But the evenings can be cool particularly in June/July when temperatures can fall to around 10 degrees C. At the Coast day temperatures vary between 22 and 35 degrees C and the evening temperatures seldom go below 12 degrees C.
Kenya is generally a dry country with over 75% of its area classed as arid or semi-arid with only around 20% being viable for agriculture. In general terms the climate is warm and humid at the coast cool and humid in the central highlands and hot and dry in the north and east. Inland rainfall and temperatures are closely related to altitude changes with variations induced by local topography. Across most of the country rainfall is strongly seasonal although its pattern timing and extent vary greatly from place to place and from year to year. The coastal belt along the Indian Ocean receives 1000 mm or more of rain per year with most falling from April to July as a result of the south-easterly monsoon. Another moist belt occurs in the Lake Victoria basin and its surrounding scarps and uplands mainly due to moist westerly winds originating over the Atlantic Ocean and Congo Basin. Here rainfall occurs reliably from March to November. The upland plateau adjacent to this area is less influenced by the lake and rain falls mainly in March-May and July-September. In much of the central highlands including Nairobi there is a bimodal rainfall pattern with most rain falling in March-May (the long rains) and October-December (the short or grass rains). The remaining 70% or so of the land area falls into the 'arid lowlands' zone with rainfall averaging less than 500 mm and varying greatly from year to year. Except for the Coast and Lake Victoria region altitude is the main determinant of precipitation. The high-altitude areas over 1500 m in the central Kenya highlands usually have substantial rainfall reaching over 2000 mm per year in parts of the Mau Escarpments. However topography also has a major influence with strong rain-shadow effects east of Mt Kenya and the Aberdare mountains. Here even areas higher than 1000 m may be relatively dry. In the arid lowlands the peaks of isolated mountains attract cloud and mist and may support very different vegetation to that of the surrounding plains.